As a media planner, you need to work fast. Your tools should work just as fast as you do. 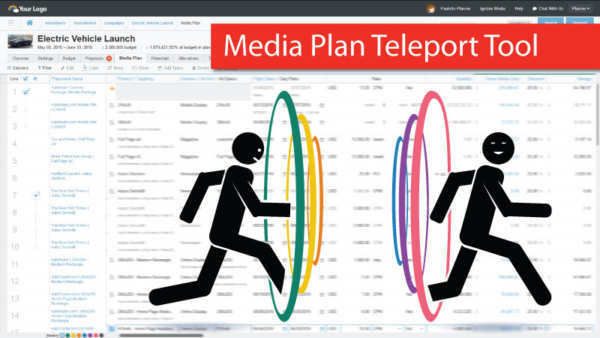 With its latest software upgrade, Bionic has upgraded its media planning software with a new teleport tool that enables you to quickly navigate your media plans. With Bionic, all your media plans are centralized and contain every important detail of your advertising placements – location, ad unit, dates, times, rates, quantities, itemized costs, advertising goals and KPIs, URLs, tasks, tags, and more. Having all this information in one place is fantastic, right? Unfortunately, having all this data on one page creates a new problem: quickly locating the information you seek when it’s scrolled away from your screen. This problem becomes especially acute if you’ve added a bunch of custom columns. It can be like finding a needle in a haystack. With the latest Bionic software upgrade, you will discover new tools that help you to navigate your media plans more quickly. First, you will notice smoother scrolling left and right, up and down. That was accomplished through improvements to the underlying code. Second, you will find a new “teleport tool” in the bottom left corner of your media planning interface. It appears as a row of circular buttons of various colors. This tool enables you to instantly scroll to the desired section of your media plan. Each of the sections of your media plan are now color-coded above the title bar. Click the corresponding color in the teleport tool to scroll instantly to that section. Want to try out the new software? If you’re already using Bionic, you already have the new software. You got it as part of your subscription, which includes free upgrades to keep you up-to-date on the latest and greatest media planning tools.